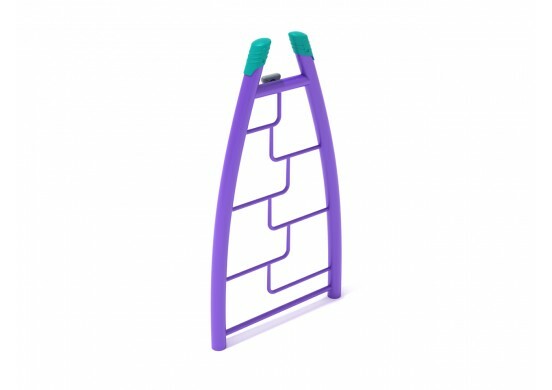 The Pick N Play Curved Panel Climber is a simple climbing structure which is a great surface for kids to climb on. The panel has open spaces which can be used as foot holes and injection molded hand grips, creating a unique climbing surface. The climbing path is relatively short, meaning it is a moderately easy challenge which can be enjoyed and completed by any school aged child. When they reach the top, they can easily hop back down to start again, this time using different steps. The colorful panel, grips and transparent holes give it a vibrant and lively style, and even the panel itself has an ornate molding pattern which gives it a highly decorative appearance. This is a great complement to different styles of Pick N Play pieces, such as spinners. The colors can be customized to match with the rest of your Pick N Play structure.